Mexican food is one of my favorites, but the title isn’t a reference to chips and salsa. What could be better than a little Mexican cuisine? As a guitar player there are several choices we make to insure we sound our best, a good guitar being at the top of the list. But, there’s also the choice of what to string it up with and lastly finding the perfect pick. Have you ever had someone find out you play the guitar, then hand you one and ask you to play something for them? Their guitar might be bearable, but usually the pick they hand you is not. Sometimes you can get used to it and compensate, but most likely you’ll fight it till your “performance” is over. Been there? After realizing that this was going to happen to me time and time again I started carrying a pick in my wallet. My point is this, when you have a favorite or preferred type of guitar pick you’re used to playing with, a foreign pick just doesn’t feel right. I couldn’t resist the urge to try a Blue Chip for long, and when my TD 60 showed up in my mailbox I was anxious to see if it would live up to the praise it was receiving. I quickly opened the small package hoping my $38 wasn’t spent in vain. From the moment the pick touched my strings it just felt right. I didn’t have to “get used to it” and the amazing part was that I immediately noticed better tone and smoother notes. Of course I sat there for a while switching back and forth to confirm my initial experience, but the more I played with it the more I loved how it felt and the tone it allowed me to achieve. As with any guitarist, my sound has been shaped over the years by a number of factors, but I believe Blue Chip Picks have had a part in creating what I sound like today. They’re bright, smooth and don’t “color” the sound of your instrument, keeping your guitar’s own unique tone. 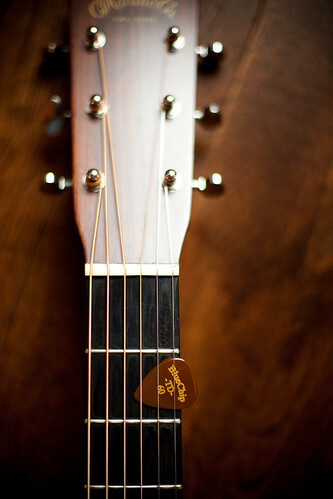 So, give one a try, but if you’re prone to loosing your guitar picks you might want to work on that habit first.